Guide for add background music into flipbook with Flash Digital Magazine Maker. I found every success flash catalog have beautiful background music, so when readers view this flash book will feel released. With this reason, I hope I create flipbook could embed background music, how can I do this in Flash Digital Magazine Maker? Yes, you can add background music into your created flipbook with our flipbook software (A-PDF to Flipbook). 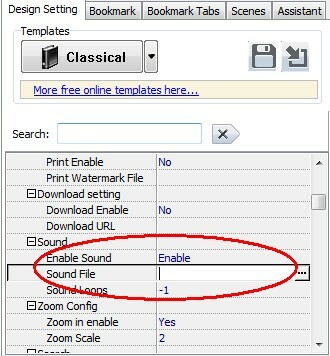 Step3: Find out Sound bar under Design Setting Panel (Design Setting -> Tool Bars Settings -> Buttons Bar -> Sound), and select enable option in “Enable Sound” bar, import sound file into “Sound File” bar. Step4: Click “Apply change” to refresh flipbook settings, then you and your readers can control background music through sound button at flash toolbar.